Wacoal Europe are leaders in the lingerie and swimwear market, with a portfolio of brands, each with their own personality and position in the market. 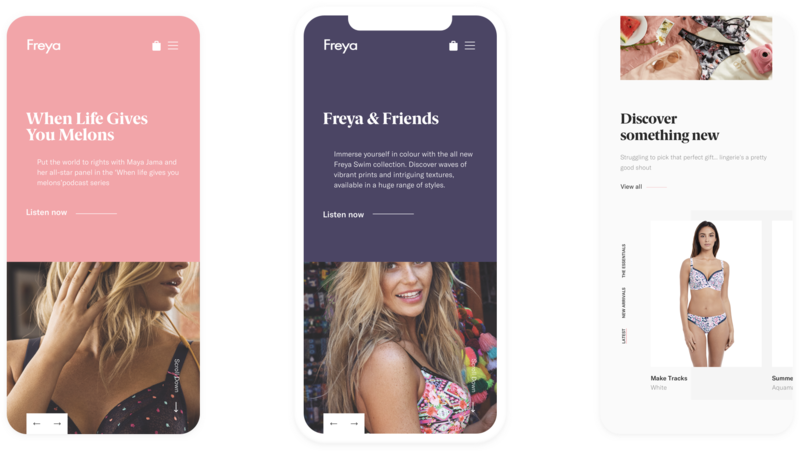 Working closely with the Wacoal e-commerce and marketing teams, we came up with a strategic approach to reshape their entire portfolio, bringing them forward into the digital age. Leading the pitch, our approach was a simple one, be bold, be minimal, make it fun! But we needed to be mindful that the solution could be flexible enough to handle each of the brands unique personality and position, in multiple markets, both commerce and non-commerce. Of all the brands Freya was the most established, offering lingerie, swimwear and activewear. So it was a simple choice to use it for our early concepts. These early concepts aim to establish a direction rooted in aesthetic and personality, through the use of bold colour, typography and strong imagery. The balance of brand, lifestyle and commerce content encourages the user to make selections and product choices. We set out to create an experience that maintains a lot of the immersive interactions that are present on the desktop, creating a fully responsive website, rather than one that is merely rescaled. The eCommerce product listing pages and product detail pages are designed to highly visual and seductive providing context and motivation through original creative content, such as videos, trends, collection call-outs, and branded imagery.